BEIJING, June 24, 2017 – Delivering big, positive stroke outcomes for the world’s largest population is the aim of the American Stroke Association (ASA) and Chinese Stroke Association (CSA) with the launch of a quality improvement program adapted from the American Heart Association’s guidelines-based program called Get With The Guidelines®. The program works to improve treatment for, and prevention of, cardiovascular and stroke events by helping hospitals and providers consistently adhere to the latest scientific treatment guidelines. In the last 15 years, Get With The Guidelines has transformed patient care for heart and stroke patients in the U.S., helping hospitals and providers learn the correct treatment and translate guidelines into practice. This program has saved lives and resulted in more than 400 scientific publications that advance heart and brain health around the world. The adapted Get With The Guidelines program, designed through a collaboration of the ASA and the CSA, endorsed by the China National Health and Family Planning Commission, and supported by Medtronic, is a set of “best practices” that aim to continuously improve treatment, enhance the quality of care, and prevent future stroke events in China. While several evidence-based, highly effective, guideline-recommended therapies are known, adherence to guidelines for stroke care remains incomplete and highly variable from region to region, and country to country. Enhanced education for EMS and pre-hospital caregivers, especially since analysis shows only 13 percent of Chinese stroke patients arrive at the hospital by EMS, versus 50 percent in the U.S.
A reduction in “door-to-needle” times for patients to receive the clot-busting drug tPA. To-date, analysis for rates of compliance with evidenced based therapies notes significant gaps in timeliness to tPA treatment. Increased awareness and application of mechanical endovascular reperfusion therapies in appropriate patients. Increased awareness and application of secondary prevention in appropriate stroke patients to fill significant gaps in venous thromboembolism (VTE) prophylaxis, lipid lowering therapy, anticoagulation for atrial fibrillation and rehabilitation assessment in Chinese patients. In 2007, the Ministry of Health -- now National Health and Family Planning Commission -- sponsored the Chinese National Stroke Registry and a five-year plan to increase comprehensive stroke centers in China. Establishing the registry also led to creating the Stroke Screening, Prevention and Treatment Project in 2009, and more recently the National Center of Stroke Care Quality Control in 2011. Reaching healthcare providers with the Get With The Guidelines program at Chinese secondary and tertiary hospitals – and at all stages of the chain of survival, from pre-hospital advanced medical care (also known as EMS or emergency medical services) to neurologists to even hospital administrators – is the priority. 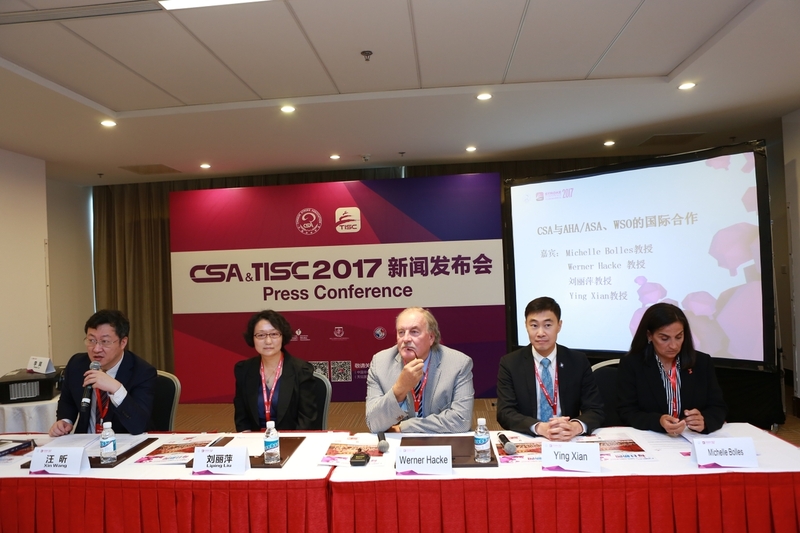 (l-r) Xin Wang; Liping Liu, M.D., Ph.D (Chinese Stroke Association); Werner Hacke (World Stroke Organization); Ying Xian (American Stroke Association spokesperson); Michele Bolles (AHA/ASA) at the AHA & CSA project announcement press conference at 3rd Annual Scientific Sessions of the Chinese Stroke Association & TISC 2017 in Beijing, China.